Hello dears, I hope you all are enjoying your last weekend of the year! I'm in the middle of my longest staycation stretch that I've had all year long, and you best bet that I am doing my best to enjoy it. Yesterday I took my brother and his entourage on a small tour of LA and so far we've gone to Mann's Chinese Theater to see the handprints, Griffith Park, photos in front of the Hollywood sign, cupcakes at Sprinkles, and finished the day with Korean BBQ. Today we plan hitting the beach cities and a getting good view of LA from the Getty Museum. Sigh, tourists. 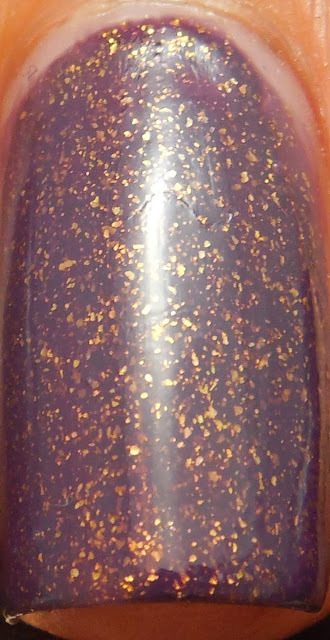 I'm a huge fan of polishes with shimmer and flakes, and when Pahlish had her Black Friday sale, I had to dive in a pick up a few lot, including Armour Falling Down. This beauty has a ton of gold flakes embedded within a gorgeous dusty eggplant base. Application was easy enough - the first was thin and streaky so for the second coat I used a generous layer which was enough to get the mani opaque. I read about a new to me technique on MUA NB about applying polish with the brush parallel to the nail. I'll have to practice this technique and see if it works for me, but the benefit is that if done properly, you won't need to use as many layers. I'll keep you posted on my thoughts! Finally to finish, I used a layer of NYC GCS. 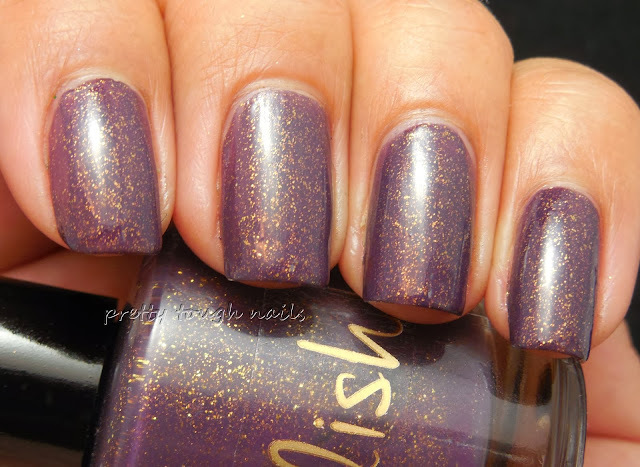 Pahlish made this a standout winner in her winter collection, especially with those gorgeous gold flakes and muted purple cream base. I love when gold and purple come together, because it reminds me of royalty and decadence. After swatching this, I'm eager to try the rest of the polishes that I got from my recent haul. The question is, where to start! Ooh, love those gold/coppery flakes! Wow, perfection! :) Yes, purple & gold do look so royally together. Wonderful polish. thank you!! I need to use those two colors more often together, especially for skittles. Wow, this is insanely gorgeous! I've been wanting this one ever since first seeing a preview of it. Your swatches have convinced me that I need to get it. I'm so happy to see that the gold flakes aren't shy at all. get it get it! pahlish is having a discount code right now I think, through the end of new years day!